In listening to the needs of tradesmen, C.K Magma, the range of premium storage and personal protective equipment (PPE), from C.K tools, has revamped its Maxi and Mini bags, with tradesmen in mind. Never one to rest on its laurels, C.K tools runs an ongoing intensive product development programme investigating potential and reviewing existing product lines. As a result C.K tools has redeveloped its popular, premium quality, C.K Magma Maxi and Mini bags to deliver even greater and longer lasting performance than ever before. Now benefitting from a wider opening mouth, the exposed space inside the bag is perfect for storing bulkier tools, whilst providing easy access to kit. Following feedback, the pocket arrangement has been remodelled to suit tradesmen’s requirements now with fewer internal pockets to prevent obstruction and easily accessible external zip pockets to secure smaller tools and tool accessories. 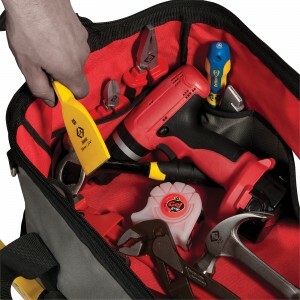 With 19 pockets in the Mini bag and 22 in the Maxi, such functional systems not only keep tools fully protected in transit but also save valuable time on a job, ensuring all tools required are close to hand. Constructed from 600-denier polyester with a semi-rigid construction, the all-new Magma bags offer maximum strength and durability, whilst long padded handles and shoulder straps allow the bags to be carried in comfort, even whilst open. A new, fully waterproof, polymer base has been designed specifically to keep tools protected and dry when placed on wet surfaces. And being 100% crack-proof, tradesmen can rest assured the bag will not crack or split on impact, even in the cold. This innovation is not only slip resistant, so can be placed on sloping surfaces without fear of it sliding away, even during transport in the back of the van, but is also easily wiped clean and resilient to scratches and scuffing – keeping the C.K Magma Maxi and Mini Bags smarter for much longer and the tools they hold secure. Created for today’s business focused tradesman keen to present a polished, professional image, the highly functional C.K Magma Maxi and Mini bags ooze style and sophistication, delivering a total package for the image conscious tradesman. Combining optimal functionality with creative style, the enhanced C.K Magma bags are designed to get the job done in style. Built to survive the rigours or every day work the new C.K Magma bags provides all the functionality, comfort and protection trade professionals need. Vanessa Troupel, C.K Magma brand manager said: “Years of working closely with end-user customers and listening to feedback has given C.K tools an in-depth understanding of the very nature of the work our customers undertake and the issues and restraints relating to that work. This knowledge has steered the company in its recreation of the already popular C.K Magma Maxi and Mini bags, changing and adding features to make it more relevant to the work and invaluable to the user.